With seconds remaining, Mbappe reacted to a late challenge from midfielder Teji Savanier and shoved the player forcefully to the ground. 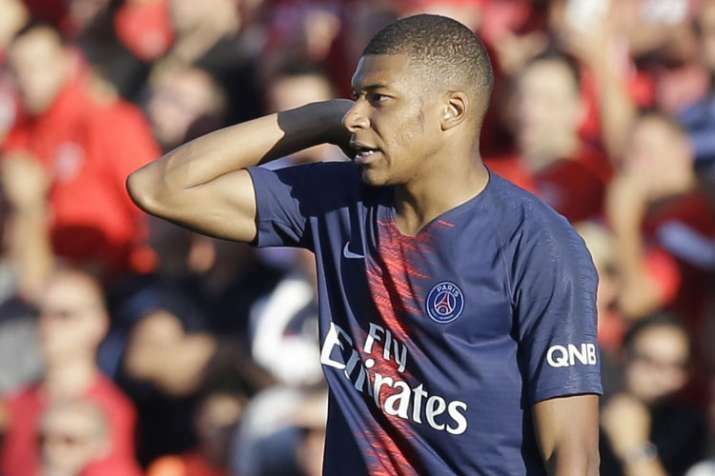 Kylian Mbappe scored a brilliant late goal and got sent off right at the end of Paris Saint-Germain's pulsating 4-2 win against Nimes in the French league on Saturday. Two weeks after coming off the bench to score twice against Guingamp, he bailed out PSG with an unstoppable 77th-minute strike to make it 3-2. Chasing down a high ball on a PSG counterattack, Mbappe cushioned it expertly on the inside of his right foot without breaking strike, directing the ball into his path so he could then lash a fizzing shot into the roof of the net. PSG have won all four games and lead Dijon and Toulouse by three points. Referee Jerome Brisard, who showed Mbappe a yellow card for petulantly kicking the ball away in the first half, instantly brandished a red. Mbappe stomped off, looking unhappy. But the 19-year-old star of France's World Cup-winning campaign was berated by his own goalkeeper Alphonse Areola for his wild reaction. Savanier was also sent off. Mbappe will get an automatic one-match suspension but does not regret what he did. "If it happened again, I'd do the same thing and I'd say sorry to all the fans and everyone else, but I can't tolerate this kind of thing," Mbappe said. "If it's the same foul when a player's trying to go for the ball, that's no problem, but he had no intention to go for the ball." Neymar and winger Angel Di Maria put PSG seemingly in control at 2-0 by halftime. Then at 2-1 with 20 minutes remaining, Thiago Silva caught the back of midfielder Theo Valls' leg as he turned inside the penalty area. Brisard waved away penalty calls but changed his mind after video review. Savanier equalized from the spot and Nimes had clawed back from 2-0 down. PSG were firmly on the back foot against the club with the smallest budget in Ligue 1, and which had not played in the top flight since 1993. Goalkeeper Gianluigi Buffon, replaced for this game by Areola, shouted at his PSG teammates from the bench in a bid to wake them up. But Nimes was on a roll and almost made it 3-2 as defender Sofiane Alakouch hit the crossbar. Then, Areola saved his side with a leaping stop. "I warned my players this week about the intensity of the Nimes players. Against such opponents, you have to concentrate at all times," PSG coach Thomas Tuchel said. "It was a complicated match in a difficult atmosphere and on a horrible pitch." Dijon could have joined PSG at the top but lost at home to Caen 2-0, while Toulouse moved onto nine points after winning at rock-bottom Guingamp 2-1. In other matches, it was: Angers 1, Lille 0; Reims 0, Montpellier 1, and Strasbourg 2, Nantes 3.